Our Job Search for Seniors is based upon your individual needs and is facilitated through a one-on-one coaching and training experience. You receive a Job Search Handbook with home learning exercises and 14 audio instructional CDs which complement your weekly office/telephone sessions covering how to interview, contact employers, negotiate an offer and prepare a resume. Service is offered in four-week and eight-week instructional sessions. Our specialty is coaching for positions where a person has no experience by finding the hidden jobs which are filled before they are ever listed. 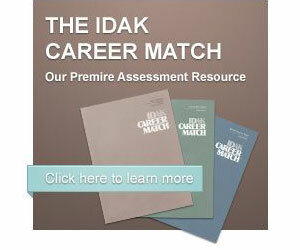 Some clients contact IDAK with a clear description of their career goal. They ask for help in their job search, how to be more competitive, how to find the hidden jobs. The IDAK Job Search is based upon the client’s individual needs and is facilitated through a one-on-one coaching and training experience. There are no group sessions. Each client receives take-home learning exercises and audio instructional CDs which complement the weekly office sessions. We have both four-week and eight-week instructional sessions. We guide you to develop a personalized job search campaign for your chosen career target for the city/state of your choice (anywhere in the U.S.). Emphasis is on developing an in-depth search in a chosen career target as well as responding to publicly advertised vacancies. Your training will include two levels of instruction: Basic and Advanced. Both the four-week and the eight-week service include the complete take home training materials. The eight-week version provides four additional weeks of service.